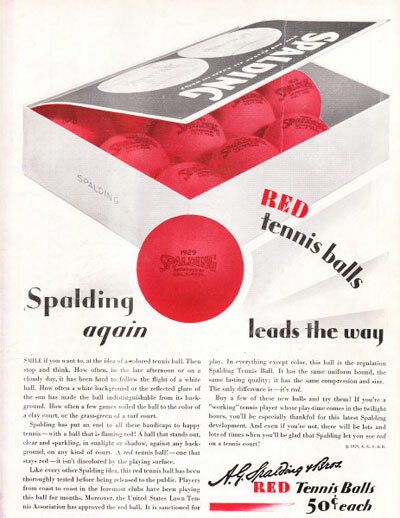 According to the June 20, 1929 ad printed on the back cover of American Lawn Tennis, Spalding introduced red tennis balls that year. The text from the ad (shown below) explains the theory behind the new colored balls. SMILE if you want to, at the idea of a colored tennis ball. Then stop and think. How often in the afternoon or on a cloudy day, it has been hard to follow the flight of a white ball. How often a white background or the reflected glare of the sun has made the ball indistinguishable from its background. How often a few games soiled the ball to the color of a clay court, or the grass-green of a turf court. Spalding has put an end to all these handicaps to happy tennis – with a ball that is flaming red! A ball that stands out, clear and sparkling, in sunlight or shadow, against any background, on any kind of court. A red tennis ball! – one that stays red – it isn’t discolored by the playing surface. Like every other Spalding idea, this red tennis ball has been thoroughly tested before being released to the public. Players from coast to coast in the foremost clubs have been playing this ball for months. Moreover, the United States Lawn Tennis Association has approved the red ball. It is sanctioned for play. In everything except color, this ball is the regulation Spalding Tennis Ball. It has the same uniform bound, the same lasting quality; it has the same compression and size. The only difference is – it’s red. Buy a few of these new balls and try them! If you’re a “working” tennis player whose play-time comes in the twilight hours, you’ll be especially thankful for this latest Spalding development. And even if you’re not, there will be lots and lots of times when you’ll be glad that Spalding let you see red on a tennis court!